slate address sign. Irish theme custom plaque features a large shamrock in the center. Personalized with the family name, house number, and street name you supply. Made in USA. 12"W x 16"H. Vertical orientation. Designed to hang from a bracket (your own or the optional Stone Mill wrought iron bracket shown in Related Products). Available with personalization on one side or on two sides. The one-sided sign has the name & address you supply and the shamrock on the front only. 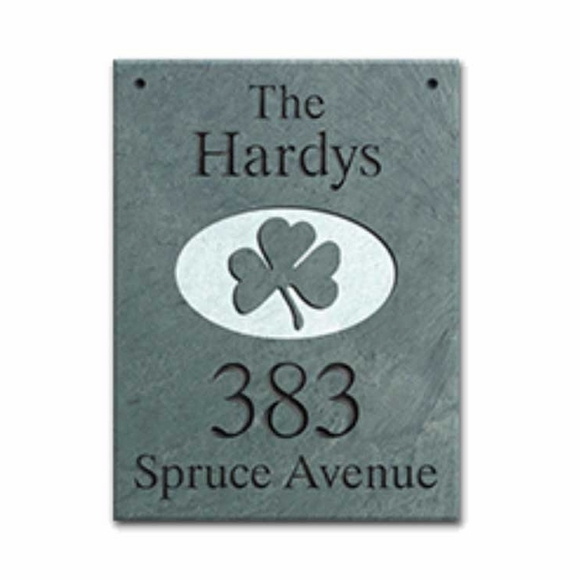 The two-sided sign has the name & address you supply and the shamrock on the front and the back. (Note: personalization is exactly the same on both sides). Made from newly quarried slate hand cut to size and shape. The features and color variations inherent natural rock enhance the beauty and unique character of these slate signs. Vertical orientation with four lines of text with a golf ball in the center of the sign. Four color choices (from left to right in small images): BW black with white characters; BG black with gold characters; GB green with black characters; and GW green with white characters. "The" at the top is standard on this sign. Family name line holds up to fifteen (15) 1.5" characters. House number line holds up to five (5) 2.5" characters. Street name line holds up to fifteen (15) 1.25" characters. Character count includes spaces and punctuation. Please allow 3 to 4 weeks for delivery. Hang on a post close to the road for excellent roadside visibility.